The haul from Deanna's ALDI trip. I find that I am often a bit naive about how Americans truly eat at home, regardless of the fact that I make a living from writing about food. I eat out a lot and I when I cook at home, it either leans towards the clean, healthy side (to counteract all the eating out) or it turns into a production somehow related to a story. That's not to say I live in a vacuum, but I realize that sometimes my grasp of what the typical grocery run looks like it a bit slippery. I remember shopping at LDI with my Aunt Laura and her kids growing up. It was the first stop on the bi-weekly shopping trip, followed by Tops, Grand Union, and Price Chopper if absolutely necessary. 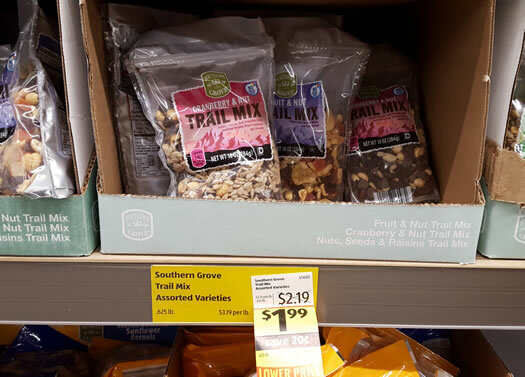 The generic-looking packaging under ALDI private labels, the fact that you had to bring your own bags, and the way the entire system worked always gave me the impression that ALDI was low-quality. Now, some of my favorite food enthusiasts shop there... and they won't settle for subpar. So there's got to be something worth checking out. Most of my shopping happens at my local Hannaford and a great farm market near my house. I'll make monthly or bi-monthly trips to specialty shops and ethnic markets to grab things I can't find in traditional stores, and most of the stuff I purchase doesn't go on sale that often or get promoted through coupons. I was nervous to shop at ALDI -- Would anything I actually buy be there? Will I find that big of a difference in pricing based on what I usually buy? -- but recent announcements that the chain plans to expand its organic line and continue to remove artificial colors, pesticides, preservatives, growth hormones, and partially hydrogenated oils from its private-label products, all while keeping prices low, bodes well with me. 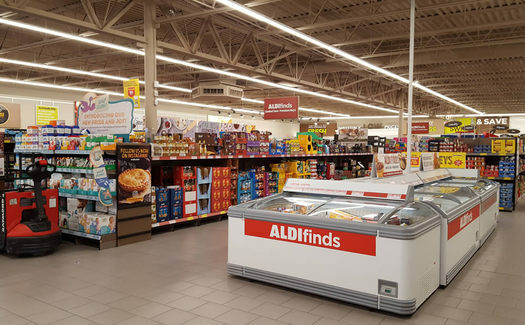 There is lot of information on the internet about the hows and whys of ALDI's practices (which you can easily find and I won't regurgitate for you), but one cost-comparison found ALDI to 30 percent cheaper than a Walmart on a basket of items. Most of that comes down to volume pricing, privately-branded products (with a double guarantee) that don't compete for shelf-space will lots of other brands (think only one brand of raisin bran instead of four or five), and economy staffing and services, meaning you bag your own groceries at a large counter in the back of the store after paying, there is no cart return (see below for more on that), products are left in bulk boxing and placed in groups to mimic shelves, and there are no ancillary services like pharmacies, rentals, and banking. + Bring your own bags or be prepared to find spare boxes on the shelves to pay your own products. + Also bring a quarter: You'll need it to release a shopping cart from the chained-up corral. You'll get your quarter back when you are done. 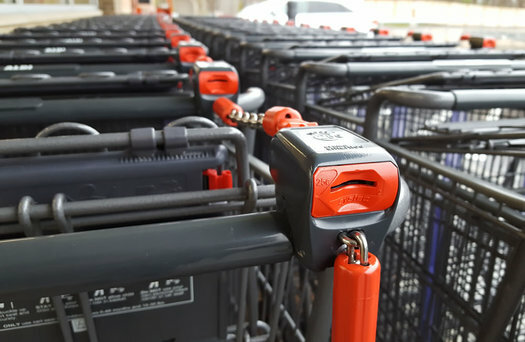 This ensures customers bring carts back to the front of the store (therefore reducing staffing costs) and lessens the chances the carts will be stolen. Cashiers push your goods into an empty cart for you to bag after paying at a big counter near the check-out. + ALDI used to be cash-only (which was prohibitive for those on subsidies), but now you can use debit, credit, and EBT cards. 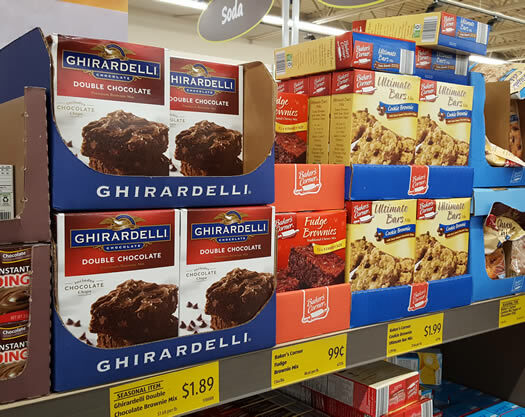 Most of my personal shopping revolves around pantry staples like beans and grains, cereals, some snack products for my kids, baking items, produce, and dairy. We don't eat a lot of meat at home unless its for a special occasion or I'm cooking for a story, nor do we buy a lot of processed food like readymade meals, condensed soups, or convenience items. + I bought a 10-ounce bag of chocolate and cranberry trail mix for $1.99, which seemed like a HUGE bargain. + A box of cereal was $1.99, about a dollar cheaper than what I usually buy. + Many friends commented on the quality of the chocolate, so I bought two 4.4-ounce versions of dark chocolate to try in baking for $1.99 each. + A $1.49 box of animal crackers has found its way without complaint into lunch pails. + Unseasoned grain mixes (like quinoa, barley, and farro blends) for cold salads and side dishes were a steal at under $2. + Tortilla chips ($1.19) and potato chips ($1.49) seemed every bit as good as store brand versions at other area stores. + Steel cut oats ($2.99), canned beans ($.65), and coffee ($5.29 for 33.9-ounces) were the biggest draw for me, as these are high-consumption items in my house. + I haven't yet looked into the origins of the coffee to see if it follows any discernible good-harvesting practices (like most ALDI products, the only production info is the Batavia, IL headquarters) but it tastes fine for this non-coffee snob. + Italian sausage links made without hormones, antibiotics, or animal bi-products (which is a bit confusing) came home with me at the fair price of $2.99 for a 12-ounce package. + I passed on flour, only because I'm fairly dedicated to the results I get with King Arthur. + Paper goods (toilet paper, towels and napkins), cleaning products, and pet food didn't make my cart either, as I didn't see them as a particular bargain compared to what I usually get. + I skipped out on peanut butter, since all the options I saw had corn syrup (but not specifically HFCS). The brand I typically buy relies on palm oil, though, so it's a big a six of one, half-dozen of the other issue and comes down to taste. + I also hesitated from dairy. A gallon of milk is $2.19 -- a considerable savings -- but cottage cheese, sour cream, and heavy cream all had a lot of thickeners and additives. Since most dairy at any store is going to be void of growth hormones and antibiotics, buying some of my usual dairy products here didn't make much sense to me. I did, however, buy two 8-ounce packages of cream cheese at $.99 each, since it was comparable to what I usually buy at a better price. + Some of the produce, like bagged salads, looked worse for the wear and were starting to rot, but other produce -- like lemons for $2.99 a bag, avocados for $1.49 each, and New York-grown apples at $2.89 for a 3-pound bag -- were fairly priced and good quality. + I didn't purchase condiments, baking mixes, or convenience meals, though that seems to be where the best bargains lay at ALDI. If things like crackers (cheddar Goldfish were $1.89), ketchup, pickles, and brownie mixes are something you purchase regularly, consider buying them here. + I'm going to look into the 3-liter tin of extra-virgin olive oil. At $16.99, it's a great deal if the oil is above bar. (My guess is it is so affordable because it comes from Tunisia, not from better known oil-producing regions). + Seafood is clearly labeled with sustainable harvesting information, so I'll consider buying canned tuna and frozen salmon or shrimp. + "Once-in-a-while" products -- 7.5-ounce cans of soda, specialty pasta, Danish butter cookies -- are definitely items I would keep an eye on. 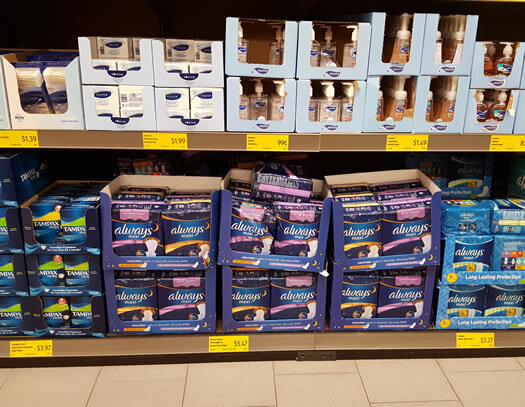 + Feminine products -- a 18-count box of Tampax Pearl tampons was under $4 -- are fairly priced. + Certain organic and specialty items items -- olive oil for $3.99, Kerrygold butter for $2.89, a pint of apple cider vinegar for $1.99, chia seeds for $1.69 -- will find space in my cart. 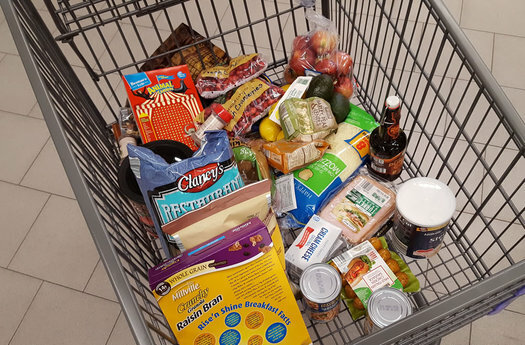 + A pound of organic pasta ($1.19) grains, cereals, sugar, some spices and international products (there is a great Hispanic section) and other pantry staples will make it onto my ALDI list. My total bill was $67.01, including a Christmas cactus and questionable-but-interesting pumpkin cider/ (ALDI does sell "silly stuff" as we call it in my house, like holiday lights, some clothing, and household goods.) The most expensive item on my list was a 2-pound bag of shredded mozzarella cheese for $5.89, and the least expensive was chickpeas for 65 cents per can. I bought 31 items in total and estimate I probably saved $40 by shopping at ALDI. ALDI is something that most average shoppers could benefit from, especially those on a budget. And it only helps to keep prices low across the board in the Capital Region's expanding supermarket competition. Everyone should have access to wholesome food by honest means. It would seem ALDI would agree, and it strives to offer real, good food at the lowest price possible. I probably won't incorporate ALDI into my weekly shopping routine -- the closest store to me is still 20 miles away -- but I will definitely make it a monthly visit. + What's a bit of supermarket shopping savvy that you can share? Aldi also has a very good selection of Gluten Free products (they brand them "Live G Free") and their labels let you know very clearly whether it contains soy, dairy, nuts, eggs or other common allergens. It's very convenient when you need to check labels closely... believe me. Fortunately my cousin told me about it or I never would have guessed they carried GF products. I love Aldi, but the one in Rensselaer needs some sprucing up. 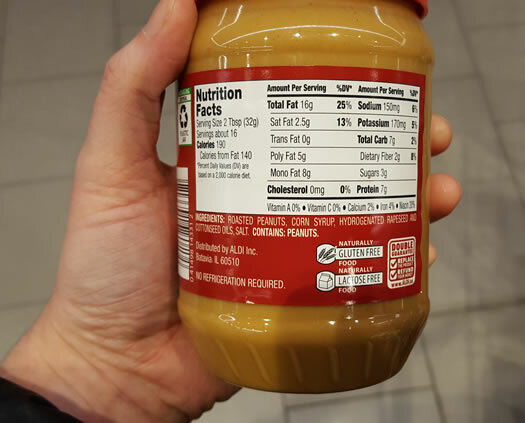 I did notice the labeling and clear indication of when something was gluten-free, egg-free, nut-free, etc. Something I plan on going back for is also the nuts and dried fruit. Probably the best pricing I've seen, even better than many bulk stores. I love this post as it definitely rounds out what ALDI is like very well! One thing in my experience, spices and herbs are a steal at ALDI too, stock up on them there. And all of the frozen fish is very good, I've had mostly anything ALDI had stocked over the past few years that was sustainable and not super high in mercury. I have been taking my mom here for a few years and began trying their items. Everything I've had has been great, with the exception of their pie crust that's comparable to the Pillsbury one. I would suggest going early for best selection of fruits and vegetables. Brilliant! I was just thinking the other day of checking it out and here you are with a great review. Just to note, Aldi does sell organic peanut butter that has nothing but peanuts in it. Also, they have amazing weekly deals on produce (particularly seasonal items) -- if you think $1.49 is cheap for avocados, they have them for 50 cents at points in the year! I'm a little surprised that there's no mention here of Aldi's connection to Trader Joe's. German Style Sauerkraut, cured with white wine, in 24 oz. glass jars for $1.69. Identical looking glass jar with identical ingredient label is at least a dollar more at Price Chopper. Braunschweiger style liverwurst in a 1 lb. roll is only $1.99 and very tasty. Love their unsweetened almond milk, only $1.99 for a 1/2 gallon carton. Lower in calories, too! I do like Aldi, but the locations are very inconvenient for me, so I'm never there. For similar inventory and prices, see also: Save-A-Lot and Ocean State Job Lot. I'm so glad to hear that you don't benefit from coupon clipping. And I'm not being sarcastic since I'm in the same boat. Nothing offered in coupon savings is what I eat or use. I wish I could appreciate a buy-one, get one or two free coupon for cereal or bread or cookies but it's never anything I ever eat. What I do take advantage of is when the produce department has reduced prices on a certain guacamole that I love, mark downs on soon-to-expire produce. And highly discounted meat either early in the morning or late at night. I just went to the Aldi's in Colonie for the first time. Since I'm of German descent, I was interested in the German origins of the store. It's German alright -- East German. If I take my 84 yr. old father there, I could say, "Hey, Pop, remember stores like this before you fled the Soviet sector?" In short, Aldi's is not for me. Ich bin nicht ein EinkÃ¤ufer von Aldi.